Sinn Féin has said there is no room to change any aspect of the backstop in the Brexit Withdrawal Agreement and that Irish politicians would not be to blame in the event of a hard border in Ireland resulting from a 'no deal' Brexit. 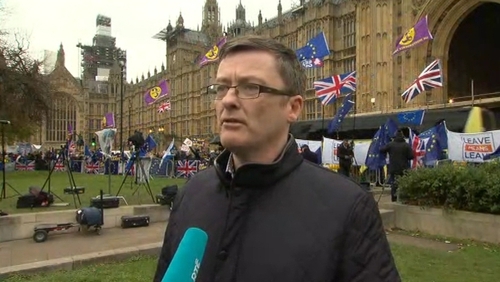 Speaking to RTÉ in London, David Cullinane said: "If there is a hard border, that will come about because of chaos in Westminster, not because of anything Irish politicians have done." "It is absolute nonsense. We’ve had two years of negotiations between the British government and the EU which resulted in basic protections for Ireland which are in the protocol known as the backstop. "They cannot be changed, they cannot be nuanced, they cannot be renegotiated. "Theresa May cannot tear up an agreement, which has been painfully negotiated over two years, chasing some phantom agreement which doesn’t exist." Earlier today, the DUP's Brexit spokesperson Sammy Wilson said the "backstop is toxic and it has to be removed". Mr Cullinane added that: "Politicians in Westminster need to understand that the days of politicians in Britain pushing around Ireland, and threatening the Irish people that if they don’t accept any changes to the backstop then there will be a hard border, have to be gone. "We have negotiated in good faith with the British government. We have achieved collectively between opposition and Government a backstop to prevent a hardening of the border and to protect the Good Friday Agreement. "As far as we’re concerned that can’t be changed nuanced or reopened to satisfy hard Brexiteers in Britain or the hard right in the Tory party. Asked if he was concerned that no agreement would result in a hard border, Mr Cullinane said: "If there is a hard border, that will come about because of chaos in Westminster, not because of anything Irish politicians have done. "If [the Tories] are so reckless to crash Britain out of the EU then there’s one obvious solution and that’s to have a border poll and end the partition of Ireland."